In what appears to be one of the quickest succession of releases for Windows 10 Pro for Windows Insider participants, Microsoft has released another new build to Windows Insiders on the Fast ring on May 29th, 2015. This time it’s Windows 10 Pro Build 10130, which came less than 10 days after Windows 10 Pro Build 10122 was officially released, and several days after Windows 10 Build 10125 was leaked. Windows 10 Build 10130 is now available for immediate download and upgrade via Windows Update. If you’re installing the leaked Windows 10 Build 10125, ensure that your Windows Update’s settings is set to “Fast” for frequency of getting the new builds. In fact if you’re coming from Build 10125, there is much lesser changes noticeable, with the most obvious probably the new icons. As Windows 10 Build 10130 is currently available only for the Windows Insiders on the Fast ring, though Microsoft intends to push it to Slow ring if the build have lesser bugs. Therefore no ISO images have been released, at least not yet Windows 10 Build 10130 ISO has been released. 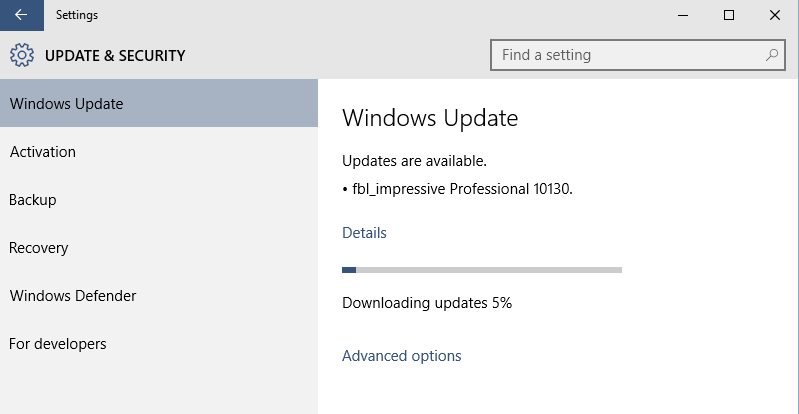 Thus, to fresh install Windows 10, download and install Windows 10 Build 10074 ISO, and then update to Build 10130. Windows 10 Build 10130 has the full build version string of 10130.0.150522-2224. Also available at the same time is Windows 10 Enterprise edition. Start: You can now customize your Start experience by opening the Settings app > Personalization > Start, including turn on full screen Start when in the desktop and customize the locations that are shown on bottom left of Start where you see Power and All apps listed. Icon design: We’ve updated our icon design to reflect Microsoft design language, creating a more consistent and cohesive look and feel across all our product experiences. These icons are more modern and lightweight, while creating a better visual relationship between typography and iconography. On top of that, app icons are now more consistent between desktop and mobile so apps like Word and Excel look similar no matter what device you’re using. Jump Lists on the Taskbar: Refined UI for Jump Lists so that it matches the rest of the new UI for Start and the Taskbar in Windows 10. Right-click on File Explorer if you have it pinned to your Taskbar and check out the updated Jump List. Continuum improvements: When in Tablet mode, you can now swipe the top edge to open up the app commands if the app has them just like you could on Windows 8.1. Improvements to Microsoft Edge: Include the ability to pin/unpin the Cortana pane, Favorites pane, Reading list pane, or any other pane in the browser. Also introduced more advanced print options. Improved Address Bar badges. Improvements to Reading view to support different content, window sizes, and device layouts such as the Surface Pro 3 in portrait. And playing full screen video on websites like YouTube or Hulu now work as you would expect. Taskbar settings for Virtual Desktops: A month ago we introduced two Taskbar configurations for Virtual Desktop users and asked Windows Insiders to vote for their favorite. On one hand there is the global Taskbar that shows windows across all desktops and on the other hand there is the filtered Taskbar that only shows windows on the current desktop. Thousands and thousands of you have taken the opportunity to rate your experience living with these configurations. On average the satisfaction score for global Taskbar was 3.8 versus 4.2 for filtered Taskbar. We also observed users are 34% more likely to be strongly satisfied with the filtered Taskbar and three times less likely to be strongly dissatisfied compared to the global taskbar. The Insiders have spoken! The Taskbar will be filtered by default starting with this flight. Don’t worry global Taskbar fans, you can have it your way with just a settings change: Settings app > System > Multitasking > Virtual Desktops. Cortana keyboard shortcut: For all you keyboard shortcut lovers out there – try out Win key + C. This will now launch Cortana’s speech recognition to ask questions, set reminders etc. Microsoft Print to PDF: The feature in Windows 10 for printing to PDF now called “Microsoft Print to PDF”. To try it out, simply select “Print” from app and choose “Microsoft Print to PDF” as printer. If you were using “Print as a PDF” previously, you can remove it from Control Panel > Hardware and Sound > Devices and Printers > right-click on “Print as a PDF” and select “Remove device”. Playback improvements with the Movies & TV app: You can now play videos in the Movies & TV app in full screen mode with this build.